I do a lot of home improvements around the house. The most recent was replacing my front door with a new one. That went just fine. However, when I was working on putting the interior trim back up, I had quite a hard time getting those little brad nails into the trim without banging the crap out of my thumb and fingers. After much swearing, a bruised thumb and some creative use of a needle nose pliers, I finally got that trim up. Finally. It was ugly, painful and a chore to do. I really wish that the following product would have been available to me then. Designer Arthur Se has come up with the Nail Cushion. The Nail Cushion is a rubberized plate that has six different sized openings to hold a variety of nail sizes so you can hammer them in without crushing your tender little digits. 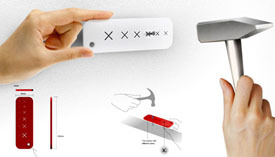 The design also ensures that the nail you’re hammering will go in straight. The cross-shaped opening also allows you to get the Nail Cushion off your wall so it’s not permanently behind that picture you just hung up. Crushed fingers everywhere will rejoice as soon as a manufacturer picks up this ingenious invention. I’d probably buy two just in case I lost one – or when someone inevitably borrows it once they see it in use – that way I’ll always have one on hand.